I noticed that there is a new update to the website of the Philippine Institute of Volcanology and Seismology (PHIVOLCS). This update brought both good news and bad news not only to me but to everyone who wanted to get plenty of information about the West Valley Fault, or more popularly known as the Marikina Fault Line. 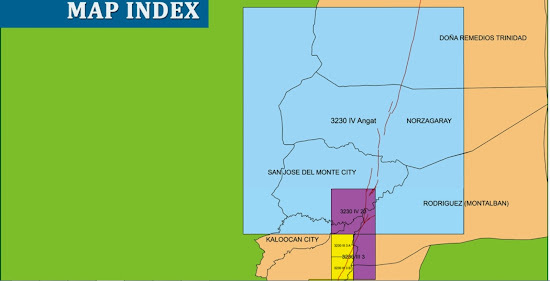 The new index map is colorful and gives a clearer overview of the areas affected by the Marikina Fault Line. The new index map shows that the Marikina Fault Line passes through the Bulacan towns of Doña Remedios Trinidad, Norzagaray, and San Jose Del Monte City; Rizal town of Rodriguez (Montalban); Metro Manila cities of Quezon, Marikina, Pasig, Makati, Taguig, and Muntinlupa; Laguna towns of San Pedro, Biñan, Santa Rosa City, Cabuyao, and Calamba City; and the Cavite towns of General Mariano Alvarez, Carmona, and Silang. The bad news is that the large scale Marikina Fault Line maps are gone. They can not be viewed on the PHIVOLCS website. I am not sure if the link to the maps was just broken or the PHIVOLCS people removed the maps intentionally. We do not know if PHIVOLCS will return the maps or not. It is good that PHIVOLCS improved the map index but that improvement is useless if the more important large scale Marikina Fault Line maps are hidden from the public view. If PHIVOLCS really want people to be informed about earthquakes and the hazards that they brings then should upload the large scale Marikina Fault Line maps back to their website.